It’s that time of year again. 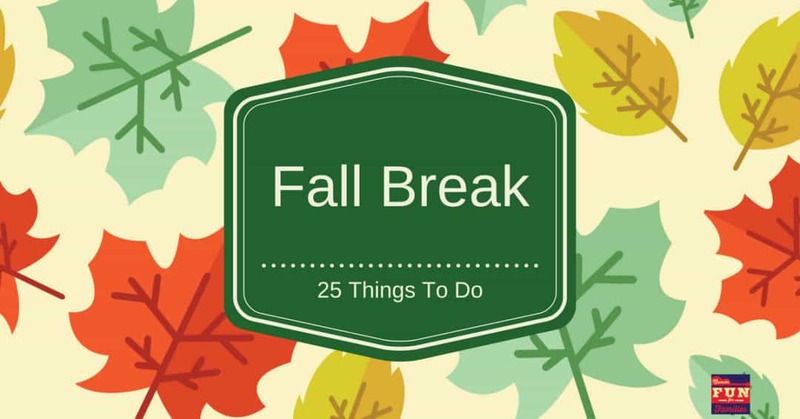 Fall Break – that glorious mini vacation from school in October. Maybe your break is three days. Maybe it’s two weeks. Or perhaps you have a full time job and only have a few fall weekends available for fun. No matter your circumstance, here’s a few ideas. Planning a trip to a haunted attraction? Check our list before you go to make sure the place you are going is appropriate for your family. Spend the day at Radnor Lake. Perfect views combined with our awesome fall weather make this the absolute best time of the year to visit. Want to get out of town? Check our day trip section for lots of ideas. Planning to stay home? Try some ideas from our Staycation plan. Make a trip to a pumpkin farm.There are so many great fun farms in our area. I pick a new one every year to visit. Don’t be afraid to drive a bit farther to visit one of these farms. You may just find a new family favorite. Visit Brushfire Pottery. Make yourself something fun or start early on some Christmas gifts. Long, lazy breakfast at the The Pfunky Griddle? I think YES! There are now 2 locations. Visit the new one in Murfreesboro and finish out your fun day at #7. The Discovery Center in Murfreesboro will entertain your kids for hours. If the weather cooperates, walk around the outdoor trails too. If your kids are too old for The Discovery Center, head to The Earth Experience Natural History Museum. My kids and I love to spend some time just walking around downtown Nashville. There is lots to see (and eat!) Downtown is family friendly during daytime hours and there are not as many tourists this time of the year. Find some iconic Nashville murals and sculptures and get some fun photos. Walk across the street to the Bicentennial Capital Mall. Grab a seat on a bench and let the kids run around for a while. Take a hike at Long Hunter State Park. Lots of trails to choose from. Make reservations for a day at The Adventure Park at Nashville. You’ll get some great pics for Instagram! If you have restless little ones, take a trip to an Indoor Playground. Let them jump the afternoon away. Tour a Historic Home. Pick a new one on every school break and your kids will grow up with a great sense of local history. Pack a picnic and spend a cheap (or free!) afternoon at the lake. Lots of choices close to home. Who’s up for ice skating? Take the family to the Ford Ice Center to perfect their triple lutz! Not brave enough to face the ice? How about some roller skating? We have several rinks in Middle Tennessee and almost all of them offer special open skate times during school breaks. How about an afternoon at Lane Motor Museum? With over 400 car displays rotated throughout the year,there are always new wheels to discover.